She was born in Oct 1537 at Bradgate Park, her family home in Leicestershire. 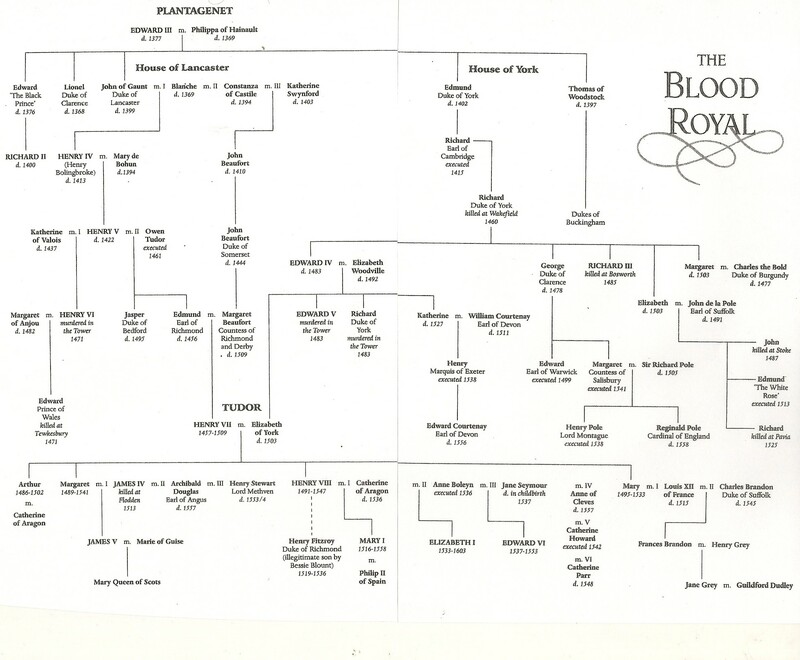 Her father was Henry Grey, marquis (Marquess) of Dorset, later duke of Suffolk in Oct 1551. Her mother was Lady Frances Brandon. She married Lord Guildford Dudley on 21 May 1553. She succeeded 6 July 1553. On 10 July 1553 parliament proclaimed her queen. On 19 July she was deposed and was arraigned for treason with her husband on 14 Nov 1553. She and Dudley were executed on 23 Feb 1554. On 23 Feb 1554 her father was executed. In the above table, she’s over on the bottom right. Jane received a solid education from her tutors, learning Greek, Latin, French, Hebrew and Italian. At nine years young, she lived with Catherine Parr, the sixth and last wife of King Henry VIII. She had Protestant leanings. King Edward, the son of King Henry VIII, was dying. He did a surprising thing. 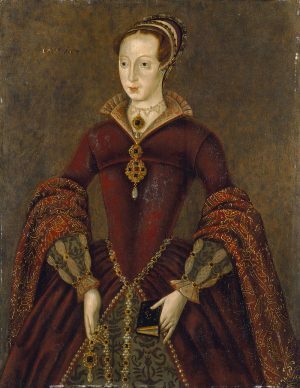 His father’s will and the Act of Succession in 1544 said that if his two daughters Mary or Elizabeth have no issue, then the descendants of Henry’s sister Mary should be monarch, in this case Lady Jane Grey. However, he wrote up a legal “Device” of dubious authority that skipped over Mary and Elizabeth and went to Jane Grey. Under the influence of dubious counselors, like John Dudley, a Protestant magnate (large landowner) who was made Duke of Northumberland, Edward used a legal “Device” to skip over Mary and Elizabeth in the succession and go right to Lady Jane Grey. Why? Edward was manipulated by Northumberland, who arranged to get his son Lord Guildford Dudley married to Lady Jane. Or maybe Edward was prejudiced against his two sisters who had been declared bastards and legitimate in turns. Elizabeth appeared uncommitted on religion at this early stage. Better a firmly Protestant cousin Jane than Catholic half-sister Mary. And the Dudleys would see advancement too. All of the above. Edward died on 6 July 1553 of tuberculosis (one historian says pneumonia, and other specialists propose other causes). Jane was acclaimed queen on 10 July 1553, but Londoners and many others did not like the arrangement. They knew about King Henry’s will, which said Mary was next in line. Meanwhile, Northumberland issued an order to Mary to come to London at once. She ignored it, for she would have been arrested and probably executed. She instead went to East Anglia, her power base, including Kenninghall in north Norfolk and then to the better fortified Framlingham Castle on the border of Norfolk and Suffolk. Her father had confiscated property from the Howard family there and the dukes of Norfolk, so the landowners and the church were her allies in that area. Allied noblemen went there with their military retinues. In reply, Mary sent a letter to the council, saying she was the rightful queen, and so she was declared queen in her absence by the London crowds on 19 July 1553, while Jane was arrested. On 3 Aug 1553 the new Queen Mary rode into London with thousands of retainers, including ladies. Elizabeth had done the same thing a day earlier. She too was popular. Elizabeth and Mary met the next day. 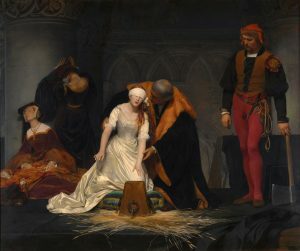 Lady Jane Grey was deposed on 12 Feb 1554—Queen of Nine Days. At first she was allowed to live because Mary saw her as manipulated by more powerful men. Then she was implicated in a plot against the queen. Jane was led to the Tower Green. The old abbot of Westminster tried to persuade her to go back to the Roman communion, but she resisted. She told the audience that she had broken the law by seizing the crown, but her intentions were innocent. She recited the Miserere psalm (Have mercy on me, O God). She put up her hair to uncover her neck. “I pray you, dispatch me quickly.” She was blindfolded. As she knelt, she asked the executioner, “Will you take it off before I lay me down? “No, madam.” She could not find the chopping block. “Where is it? What shall I do?” One of the bystanders guided her. She laid down her head. Her husband and uncles were beheaded. Jane’s father, the Duke of Suffolk, was pardoned, though one historian says he too was beheaded. She was the Queen of Nine Days. David Loades, Chronicle of the Tudor Queens (Sutton 2002). This entry was posted in Royal History and tagged Bio of Queen Jane Grey, Lady Jane Grey Queen of Nine Days by james malcolm. Bookmark the permalink.